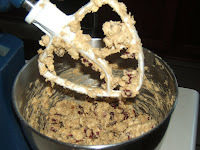 The other day I was watching the Food Network, of course, and they had a Food Bytes commercial segment on for these cookies, which feature Ocean Spray Cranberries. They just sounded so light and tasty, that I had to try them. So I did, and they turned out awesome. 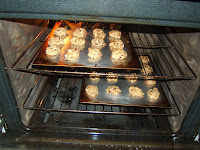 I ended up adding walnuts to my recipe, because my family is nuts for nuts :0) It was hard for me to actually get the cookies onto the cookie sheet because all I wanted to do was eat the dough...I'm a cookie dough freak. 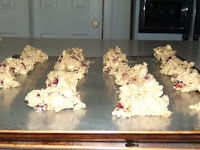 But reluctantly I put down my spoon and washed my hands, and started scooping out the cookies. 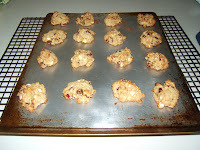 This recipe was very easy, and very fast, I was done baking the cookies in about 25 minutes, which was nice. And the recipe makes just enough cookies (about 2 1/2 dozen) so that you're not left with hundreds of cookies that will eventually just go in the trash...which is always a sad sight. I hate throwing away my creations, it always breaks my heart and I feel like I'm betraying the trash-ridden goodies! 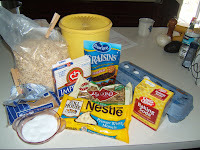 So, without further-a-doo here is the recipe!